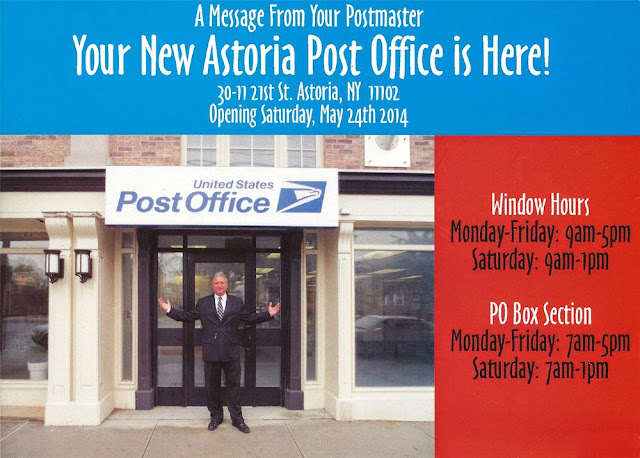 Information cards were mailed to local residents informing them of the Astoria post office's grand re-opening at its new location. Posing in the photo is recently retired Postmaster Michael Menasche, who spearheaded the relocation effort. Ah, Astoria. Remember All in the Family? Astoria was the setting for the show. Astoria is a community in Queens with a rich history and about 150,000 residentsabout the same size as Eugene, Oregon and Alexandria, Virginia. The community is undergoing rapid redevelopment with an influx of younger residents. 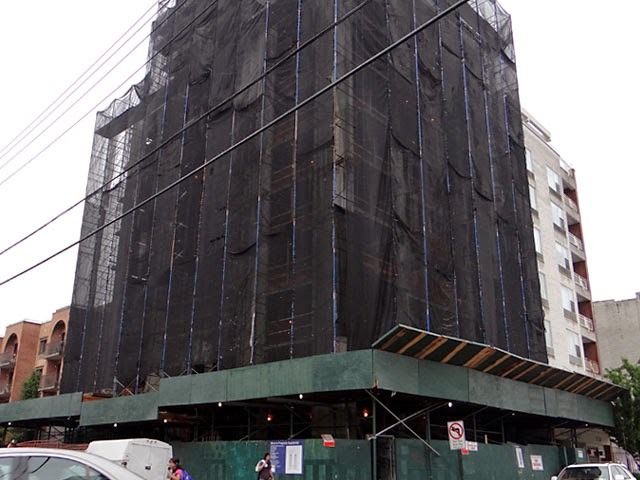 Land along the East River is hot these days, and property values throughout many parts of Long Island City and Astoria have been increasing. Hold that thought. For your reference, here is a map of the area, with convenient markers denoting post offices. Remember that thing about increasing land values? Compare the old post office building to its surroundings. See the taller structures around it? 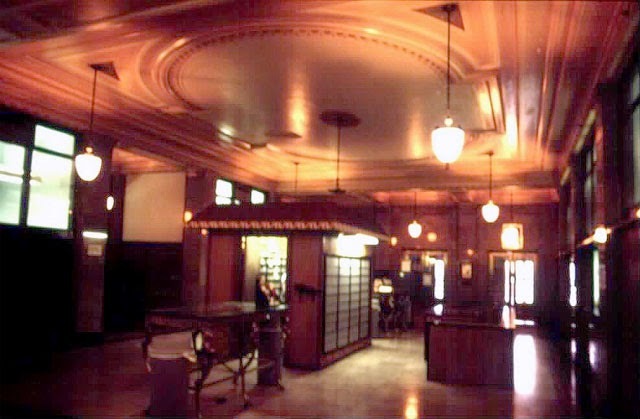 The site's owner preferred to have the site redeveloped instead of renewing the Postal Service's lease, and so the old Astoria post office closed in mid-2012. 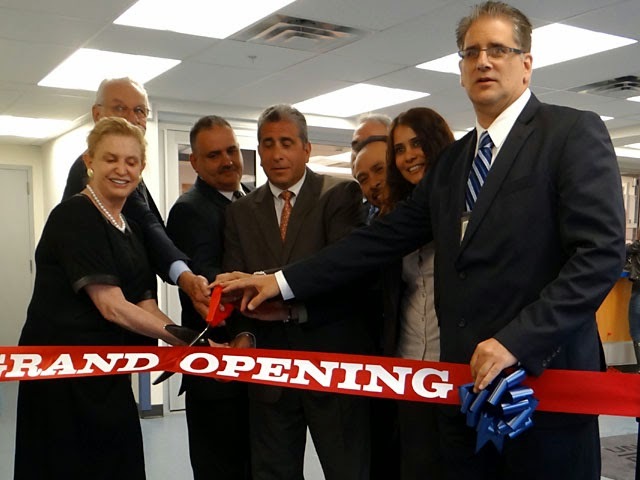 Today the new Astoria Station post office held a reopening ribbon-cutting ceremony with local postal officials and U.S. Representative Carolyn Maloney of New York's 12th Congressional District. 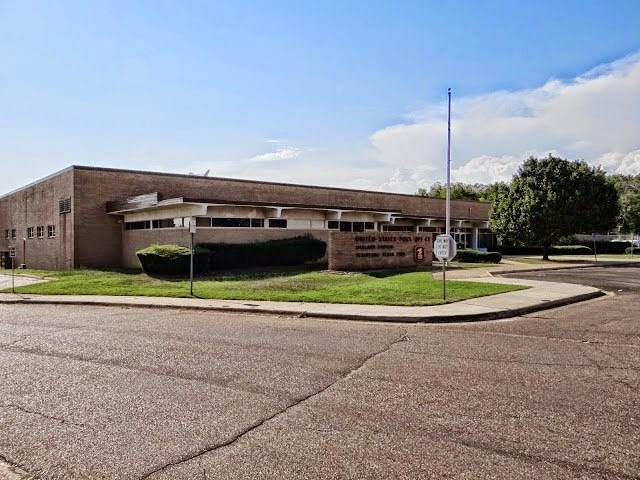 The new post office is located at 30-11 21st Street, three blocks south of its former location. 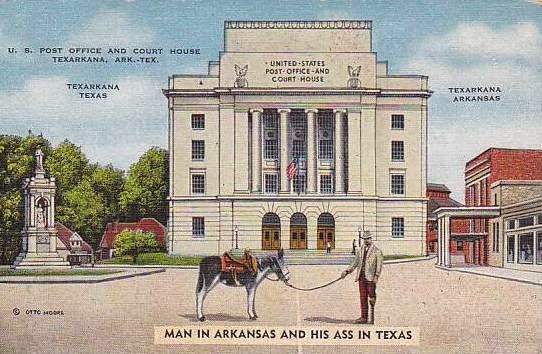 Inside, the post office maintains the Postal Service's new design standard, which features vibrant blue countertops atop faux wood frames. At the Astoria post office there are two clerk window stations. The P.O. Box area is to the left. Frank Calabrese, USPS Triboro District Manager told GP that postal officials never considered formally discontinuing the Astoria Station after its suspension in 2012. Speaking at the ceremony, he declared that he was thrilled to inaugurate this new "state-of-the-art facility." After the Astoria Station's closure in 2012, Astoria 20 carrier routes had been based out of Long Island City's main post office, two miles south. Manager of Post Office Operations John Tanna was on-hand and was also glad to see the Astoria Station reopened, noting in conversation that having carriers stationed back in the neighborhood is "much more efficient." Congresswoman Maloney spoke eloquently about the importance of post offices in their communities. In an interview with local news channel NY1 she stated that "the community absolutely loves its post office. We're going to be here to support it." She praised the new location, saying "it's a beautiful space [in] an important neighborhood." 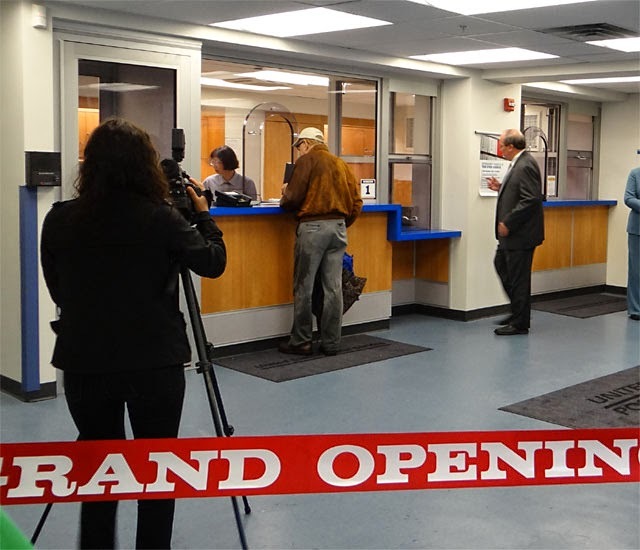 Adding that most New Yorkers "don't drive; we use mass transit or we walk," she declared that the Astoria post office is vital to this quickly growing neighborhood, adding that "reopening this post office is truly a community celebration." 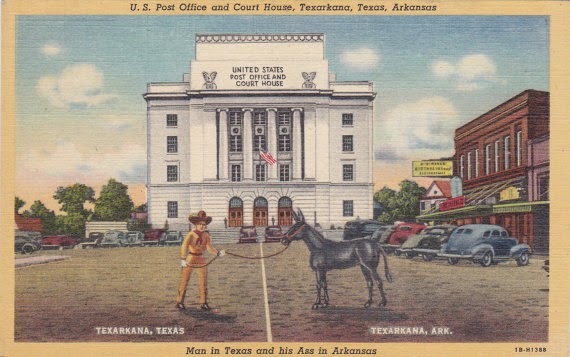 Personally, she noted, "It's wonderful to get a piece of mail." 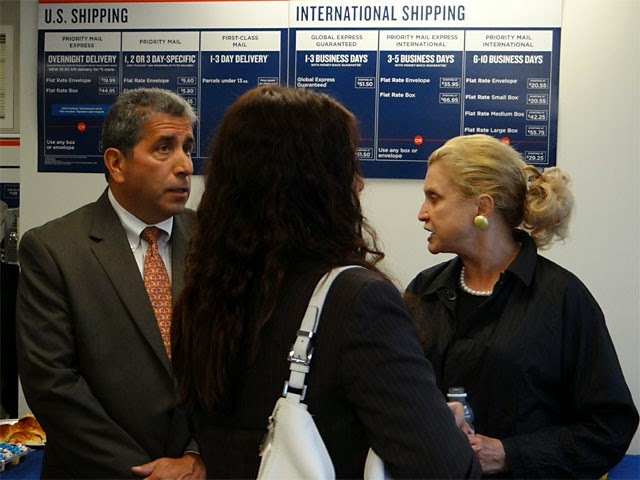 USPS Triboro District Manager Frank Calebrese and U.S. Representative Carolyn Maloney discuss postal matters prior to the ribbon-cutting at the Astoria post office, June 9, 2014. All hands on deck at the Astoria post office ribbon-cutting. 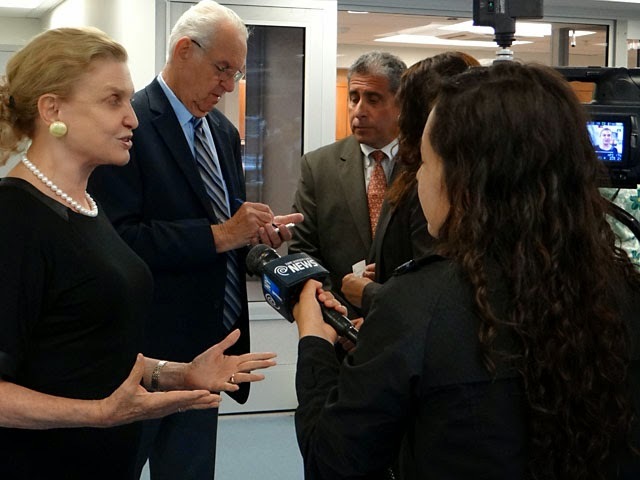 U.S. Representative Carolyn Maloney interviews with NY1 after the ribbon-cutting. 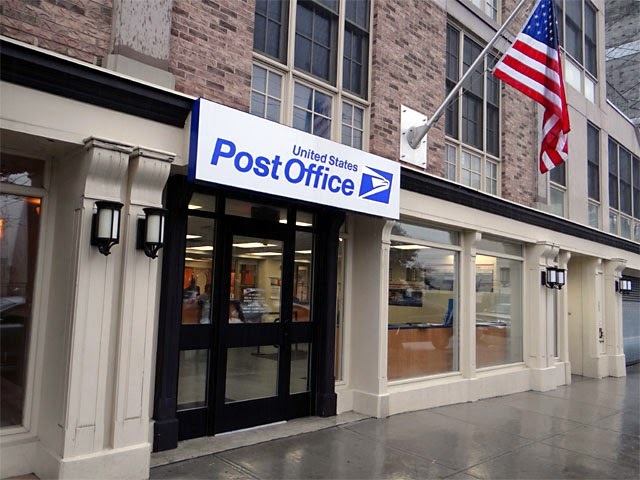 The Congresswoman also noted that the [Queens] Plaza post office was losing its lease in a manner similar to that of the old Astoria Station, vowing to work with the Postal Service and the community to "save the Plaza post office" and relocate its operations. 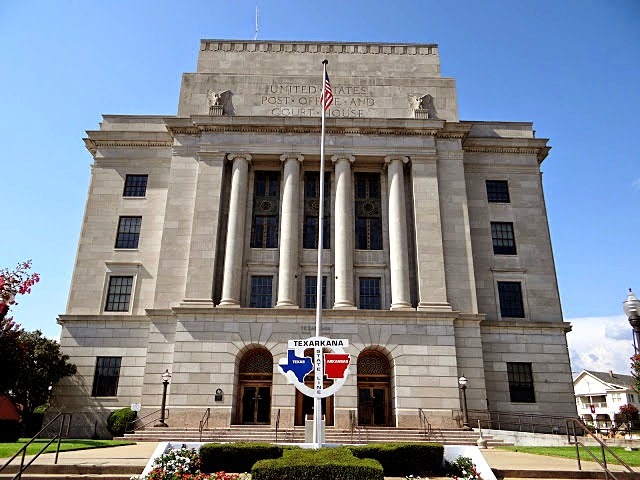 She invited public input regarding leads on a new location. Also on-hand were Station Manager Eddie Galdamez, who expressed pride in his new domain and attentively assisted customers before they even arrived at the retail window; and recently instated Officer-in-Charge for Long Island City, Scott Farrar. Interestingly enough, USPS's lease for the new site had been signed for some time and the location was fully functional back in January. Unfortunately, New York City's Department of Transportation held up the formal recommissioning of the post office; you see, with all the (20+) carriers stationed at this location, trucks need to be able to pull up, load and unload mail without double-parking and obstructing a major local thoroughfare. There's no room for parking lots here. 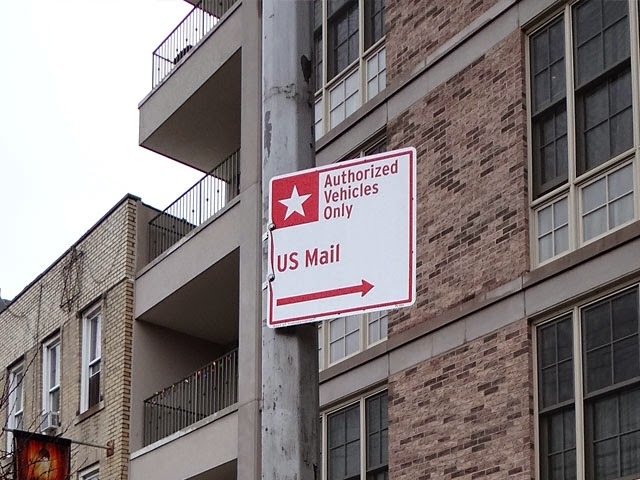 In a dense setting such as New York you often need signage to reserve such parking spots for postal vehicles. New York's DOT took more than four months to install the appropriate signage.